Spring is in the air and dust bunnies are under your refrigerator. March can be unpredictable when it comes to the weather, but no matter what Mother Nature is doing outside your window, it’s natural to crave a fresh start this time of year. Usher in Spring with a bit of cleaning, fresh flowers and a little dirt under your fingernails. Plant a tree. Spring and fall are the best times to plant trees because wet weather and cooler temperatures make it easier for root systems to get established. You may need to wait until all threat of last frost has passed before planting. Inspect your home’s exterior. Once winter storms have passed, carefully inspect the exterior of your home for damage. If you had an ice dam on your roof during the winter, now is the time to repair any damage it caused, and make changes to your roof to prevent ice dams in the future. Simplify the Cupboards. Pare back on dishes and glassware, letting go of mismatched and chipped pieces and sets you no longer love or use often. Spring-clean the kitchen. Give your kitchen a fresh start by cleaning some of the areas we often skip during quicker daily cleanup sessions: small appliances; the range hood, backsplash and light fixtures; grout; vacuum hard-to-reach places (like under the stove) using an attachment. Clean slipcovers and soft furnishings. Smaller slipcovers and washable rugs can be laundered at home; drop off larger pieces with professionals. Most items like curtains and slipcovers can be put back while damp — for the best fit and to prevent wrinkles. Treat yourself to spring blooms. 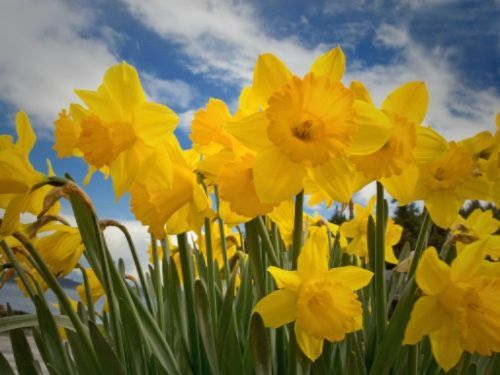 Spring flowers such as daffodils are plentiful and inexpensive this month, so keep an eye out for bargains. And if you have blooms popping up in the garden, snip a few to enjoy indoors! Make a garden plan. There’s still time to get your garden growing! Sketch out a plan and jot down ideas for this year’s plantings. Start some seeds indoors, or pick up seedlings at your local nursery. Check botanical gardens for spring plant sales, too! Tidy the entryway. Put away any lingering mittens and wool hats and make room for those mucky spring boots. Clear off the hooks (or hangers, if you have a coat closet) and be sure to put out an umbrella holder stocked for spring showers. Clean up patio furniture. Outdoor furniture can get really grimy over the winter, so be sure to give everything a good scrubbing before you start using it for the season. Launder washable outdoor cushion covers, and replace worn-out pieces if needed. Tune up lawn and garden tools. Sharp tools get the job done. Take your lawn mower and clippers in for a sharpening and tuneup before you begin work in your garden.